Kathy Karr-Garcia is a very busy woman. Besides being a successful REALTOR® and Broker with e-Pro, CRS, LMC, SFR, MRP and PMN certifications, she’s also the 2018 President of North East Florida MLS. As such, she usually doesn’t have a lot of time to spend on different “marketing things” to help her successful business grow even larger. It’s more important she spend her time providing her clients with unparalleled service, a trade mark of her business. Which means Kathy is always looking for cool new ways to generate leads that aren’t time sinks. When Kathy heard about SavvyCard’s Facebook Advertising Service, and learned that there was no monthly fee (agents are charged on a per ad basis only) and that placing an ad was as simple as telling SavvyCard “place this ad for me”, she decided to give it a try with a new listing she had just gotten. Kathy entered her new listing into the MLS and received an email containing a link to the resulting Property SavvyCard that had been automatically created. The Property SavvyCard (pictured above on the left) had all the important details about her listing that perspective buyers needed to know. 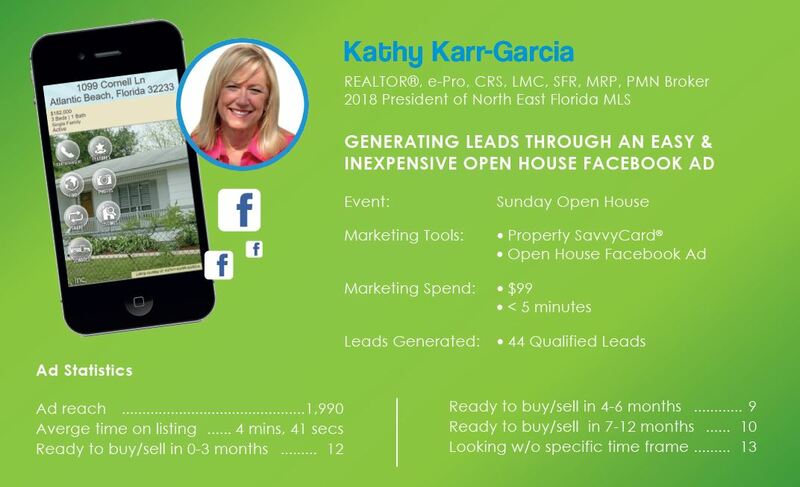 Kathy ordered a Facebook Open House Ad from SavvyCard to advertise an open house she was having in a few days. The results caught her off guard – in a good way! She received 44 leads in just a few days. The entire process took her less than 5 minutes, start to finish. Assuming Kathy converts her leads at a 1% rate (nationally, that figure varies from .5% to 5%) and earns 3% in commission on a sale, and using a US median home price of $210,200, Kathy’s expected return on her $99 ad investment is $2,774.64. Her projected rate of return is 2,700%. New listings are the most valuable assets REALTORS® have, which is why listing portals use them to generate leads, only to sell them BACK at a premium to multiple agents (not just the listing agent). SavvyCard’s agent-centric strategy enables REALTORS® to generate leads at extremely low cost, take back leads from listing portals and helps protect buy side commissions. To learn more about SavvyCard’s Facebook Advertising services, visit our Facebook Advertising Service page. If you are a SavvyCard for Real Estate account holder, you can enjoy the same successes as Kathy simply by using your SavvyCards, and even contacting us to place an ad for you. If you have questions on how to do so, please contact us at (727) 502-6012, chat with us or email us at support@savvycard.com.